Blemish Detect detects visible sensor defects (typically blurred spots caused by dust in front of the image sensor) using a tunable filter based on the human visual system. Because it is included in Imatest IT/EXE and DLL, users may need to examine or edit the INI file used to control IT versions of Blemish Detect. Most of the settings in the [blemish] section are set by the Blemish Settings window or Uniformity settings window (which can be opened by pressing the Uniformity button near the top of the Blemish settings window). A few are set by responses to other windows or user actions. INI file settings that affect several modules are described in Imatest INI Reference. (gr) Affects graphics (figures). May not be of interest for Imatest IT, where graphics is often suppressed. (index) Setting is equal to the index of the popup menu. You’ll need to open the Settings window to see these: Never used for important IT settings. (index-1) Setting is equal to the index of the popup menu – 1 (0 – (index-1)). Keeps backwards compatibility for some settings that were originally 0 (off) or 1 (on), but had options added. The region to be analyzed is normally selected by roi, which is set in the coarse and fine region adjust windows. roi contains several groups of four values, each corresponding to the nth value of image width nwid_save and height nht_save. Each group of four roi values consists of [x1 y1 x2 y2]: the Left, Top, Right, and Bottom pixels that define the Region of Interest, defined relative to the upper-left corner, not to each of the edges. So if you want a constant margin for several images (for example, you want the ROI boundaries to be 4 pixels from the borders), roi must be set individually for each image size. Blemish Detect offers an alternative method of specifying the ROI relative to the image boundaries: crop_borders, which is set near the bottom of the Blemish (or Uniformity) window. crop_borders contains five values: 1-4 are the margins (in pixels) relative to the L R T and B boundaries. The fifth value turns crop_borders on (1) or off (0). crop_borders is enabled when blemcrop==1 and crop_borders(5)==1. If blemcrop>1 or crop_borders(5)==0, crop_borders is ignored and roi is used for the ROI. bayeraw ◊ (Set by several buttons in the Monochrome image settings window) 0-5  If > 0, monochrome files contains Bayer RAW data. 1-4, indicates primary color to analyze (R, Gr, B, Gb). 5 indicates Demosaic. blemcrop ◊ (Set in Options I window) 1-3  (index) Cropping options: 1 disables normal region selection (roi) and enables crop_borders (if crop_borders(5)==1). 2 is recommended for normal region selection. blemish_analysis ♠ Blemish analysis checkbox 0 or 1  Normally 1 for blemish analysis. 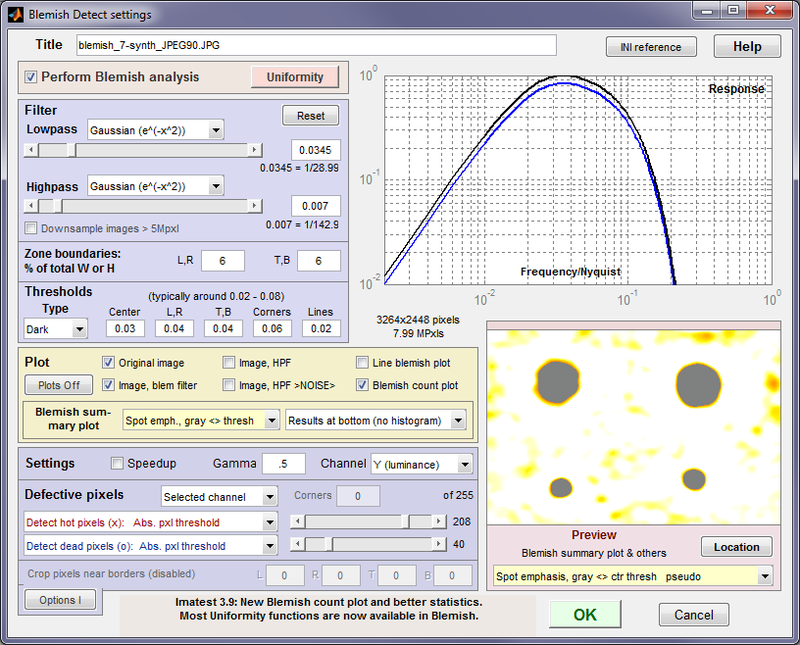 0 turns off blemish analysis (Uniformity and hot/dead pixel analysis is still available). Turning off blemish analysis speeds up runs tremendously. 0 0 Detect hot and dead pixel clusters (calcluster(1) and (2), respectively), where a cluster is defined as 2 or more adjacent defects. Example: Enter calcluster = 0 1 to detect dead pixel clusters. calcluster(2) is set if Dead_pixel_clusters_max has been entered into the pass/fail ini file. closefigs σ Set by the Close figures after save checkbox in the Save window. 0 or 1  1 recommended for IT (closes figures after save). integer  If n = corner_HD_block > 0, reduces sensitivity to Hot, Dead pixels by a factor of 2 in nxn pixel corner regions. crop_borders ♠ Alternative way of specifying Regions of Interest, relative to the image boundaries. Set in the Crop pixels near borders section (lower-left). 0 0 0 0 0 Values 1-4 are the margins relative to the L R T and B boundaries that define the Region of Interest. The fifth value turns crop_borders on (1) or off (0). blemcrop must be set to 1 to enable crop_borders. deadthr ♠ Dead pixels slider [4 8] Thresholds for detecting dead pixels: absolute value in pixels and relative % below neighbors for deadp = 2, 3.
analysis  Used in override to disable Hot/Dead analysis if set to 0.
downsample ♠ (checkbox in Filter section) 0 or 1  Downsample the image (4:1 pixels) used for blemish detection only (does not affect other calculations like hot/dead pixels) for images > 5Mpxls. Image and pixels are upsampled after the calculation. Used to speed calculations & conserve memory, Primarily for ≥13MPxl cameras. gamma ♠ (Settings area) [0.5] Used to linearize image prior to filtering. hdchan ♠ Channel popup menu below Hot/Dead pixels menus 1-3  Channel(s) for detecting Hot/Dead pixels: 1 = any; 2 = selected; 3 = all. hotthr ♠ Hot pixels slider [251 8] Thresholds for detecting hot pixels: absolute value in pixels and relative % above neighbors for hotpx = 2, 3.
hpf_set ♠ Highpass slider or text box [0.02] Highpass cutoff in normalized units. lpf_set ♠ Lowpass slider or text box [0.005] Lowpass cutoff in normalized units. nht_save ρ Set during image read 2448 … Height in pixels of recent image(s). There may be several for several image sizes. the nth value corresponds to the nth value of nwid_save and the nth group of four values of roi. nwid_save ρ Set during image read 3264 … Width in pixels of most recent image(s). There may be several for several image sizes. the nth value corresponds to the nth value of nht_save and the nth group of four values of roi. roi ρ Set during region selection (primarily in the fine adjust window) 1 1 3264 2448 (typical) Region of interest (crop) in pixels. [x1 y1 x2 y2] There may be several groups of four for several image sizes. the nth group of 4 corresponds to the nth value of nht_save and nwid_save. See crop_borders for alternative Region selection method. saveCSV σ Save window 0 or 1 [-99 = ignore] Save CSV results. Overrides save_file_list. saveJSON σ Save window 0 or 1 [-99 = ignore] Save JSON results. Overrides save_file_list. saveXML σ Save window 0 or 1 [-99 = ignore] Save XML results. Overrides save_file_list. sidereg ♠ Corners & sides popup menu 1-7  (index) (Same as uniformity) Size of corner and side regions for Relative Illumination analysis. 1: 10×10 pixels, 2: 32×32 pixels, 3: 1% (min. 10), 4: 2% (min. 10), 5: 5%, 6: 10%, 7: 64×64 pxls. speedup ♠ Speedup (checkbox in Settings area) 0 if set to 1, skip several calculations related to relative illumination to speed up operation. thresh ♠ Threshold values for blemish detection (5 text boxes) [.02 .03 .03 .04 .01] Threshold values for blemishes in Center, (L,R), (T,B), Corner regions, and Lines.